Build your own imaginative sculpture and then make it glow with sound. Believe it or not, playroom builders once had to make do with plain pieces of wood. Thanks to this interactive age, we now have light-up, sound-activated construction toys to lead the way out of those dark ages of play. 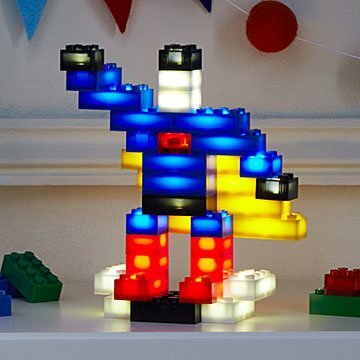 Just add blocks to the rechargeable power base to build your own amazing geometric sculptures—a nightlight, skyscraper, glowing robot, or anything that lights up your imagination. Even more brilliant, it features a sound-activated mode for another tier of interactivity. Compatible with other construction block systems of the same size, this set of 50 or 240 blocks will inspire endless creativity in kids and grown-up geeks alike. For ages 6+. Made in China. Compatible with standard Lego blocks. Includes 3" L x .5" W bricks and .25" L x .5" W bricks. Includes building ideas and instructions. My nephew will love these! Fantastic gift for my nephew. I know he will love it as a Lego fanatic. I think these are the coolest thing I've seen in a long time. Hands down a hit. Love these blocks! I've perused Uncommon Goods items before, but never purchased. I often felt items were pricy but when comparing this item to other vendors/ descriptions I'm glad I purchased from Uncommon Goods. We were not disappointed, very pleased, thank you! When the teenager opened this, everyone in the room (kids & adults) just started gathering around. It is really neat! 5 yr old boy â€”- saw it on internet and thought he needed it. He loves it. Great for children who love making things. Great for developing logic, creative development and a great collaborative activity. Stimulates imagination, another avenue away from the electronics games.